I really wish I could tell you that I spent a good chunk of spring break getting rid of toys and clothes and giving my house the overhaul that it needs. Sadly, while I did the usual laundry and daily upkeep, I didn’t spend a lot of much-needed time cleaning. My hope for our spring break, after returning from a few days at Disney World, was to catch up on my freelance projects and recreational reading. Any cleaning that happened in addition to that was gravy. But would you believe it? My kids actually expected to do fun stuff for spring break. I know – can you believe the nerve? Really, they were little troupers. I had a lot of not-fun-for-kids stuff packed into those five weekdays. Now, they did get to stay up later than usual and watch movies and play outside, but there was still tutoring and the dentist and grocery shopping. I finally took them to the park last Friday, where they could just be kids. It didn’t leave a whole lot of time for all that catching up I’d planned to do. I should have known better, but when spring break is on the horizon, it looks so sweet, has so much promise. I did make some good progress on my biggest book project (and absolutely zero on another). I edited a bunch of my novel and only had a little left when school went back into session. In all honesty, I was happy to get any of that done. But what I didn’t do much of was read for fun. Granted, I’m reading Eldest (sequel to Eragon). Not only is it close to 700 pages, but they’re a very cumbersome almost-700 pages. 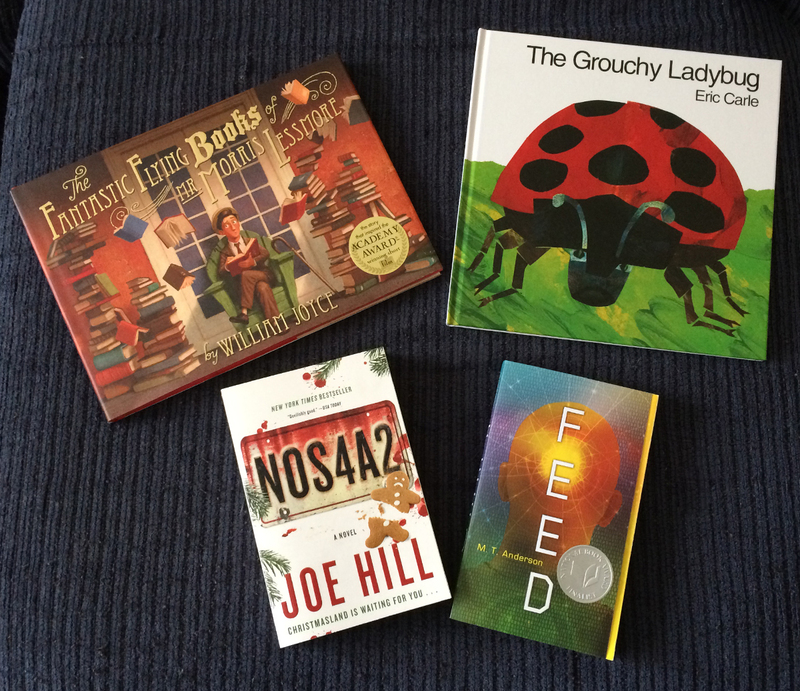 There’s a reason these books are on my book list for the third year in a row – and there’s also a reason I’m tackling them early. For the first couple months of the year, I stuck to my 2015 book list, but to get more titles under my belt and break up the pace a little, I decided to read shorter books in between the Inheritance Cycle books. Aaaaand… well, I may have fallen off my book list wagon and bought a new book. It was a shorty, I promise, and it was a really good one – a new-to-me author with a unique style that I admire, even if I can’t emulate it. (It was Daniel Woodrell’s Winter’s Bone , in case you’re wondering.) The only problem was that I made a sort-of promise to myself that I wouldn’t buy any new books until I read through all the other new books that I already own, and this was a new book. One of the other things the kids and I did on spring break was to stop by my favorite local bookstore, and because the owner knows what a sucker I am for books, she reminded me that their 40% off spring cleaning sale was coming up. You should be proud of me. I only bought four, two of them chosen by my elder son. But I have to say it makes me happy to know that there are more books for next year’s list if I don’t get to them this year. Plus, I also have to say that sometimes you get a nice surprise where you don’t expect it. That book on the top left – The Fantastic Flying Books of Mr. Morris Lessmore – is amazing. I highly recommend it if you love books; you don’t even have to have kids to appreciate it. I likely would not have bought it on my own, but Peter was excited to see it because he’d heard it before in his school’s library. I’ll have to say I’m pretty proud of my little bibliophile. Despite not checking one thing off on my to-do list, I’m pretty happy with my spring break. It’s the little things. This entry was posted in Odds and Ends and tagged Books, Editing, Eragon, Freelance Writing, Harry Potter, Reading, Spring Break, Writing. It sounds like a wonderful spring break. There’s just never enough time for reading, is there? The Fantastic Flying Books of Mr. Morris Lessmore sounds intriguing. You should check it out! Your grandkids would probably love it, too.